Our ParaLink® high strength geogrids were chosen to reinforce the base of the Duqm roads’ embankments because significantly economical and faster in construction in comparison with other feasible conventional solutions available in the Oman market, such as stone columns, vacuum consolidation, dynamic replacement. This is the biggest basal reinforcement project ever for Maccaferri. Around 1.2 million m² of ParaLink® geogrids will be installed upon completion of this project. Duqm is a port town on the Arabian Sea, in central-eastern Oman, 600 km South-West of Muscat, the capital city of Sultanate of Oman. Extensive developmental projects including sea port, airport, dry dock, oil refinery, crude oil storage terminals, factories, buildings, residential villas and the necessary road and railway infrastructures are under construction or on the anvil. The extensive presence of soft ‘sabkha’ soil ‒ a type of soft soil with high salt content which is widely present in the Arabian Peninsula and is characterized by low bearing capacity and low SPT values ‒ drastically influences the construction of foundations for civil engineering structures in that area. A basal reinforcement solution was needed for the construction of road high embankments for the new road that will serve Duqm port. The road starts from an existing intersection with National Road No.32 (Duqm-Mahoot Road) and goes towards Duqm Port and the proposed liquid berths at the seaside. 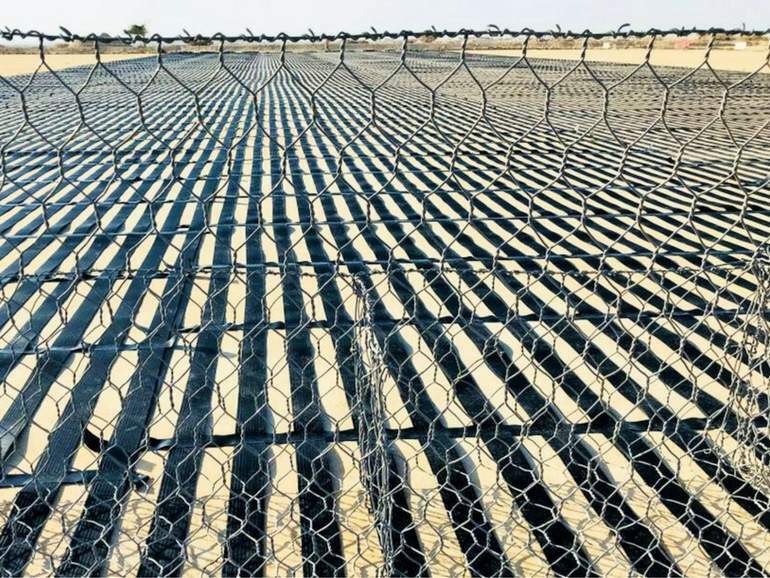 Ultra strong reinforcement geogrids like ParaLink® are a technically excellent basal reinforcement solution for the construction of embankments over soft ‘sabkha’ soils, as they satisfy the stability criteria laid by international standards like BS 8006: 2016. A wide range of ground improvement methods were explored by the designer by consulting the specialized subcontractors in each field. Generally, for sabkha soil having SPT value less than 5 in muddy conditions, the most widely used conventional solution for road projects in the Middle East region is the provision of stone columns below the road embankment for the total depth of soft soil. When comparing the different methods by their cost per unit area of road embankment base, our high strength geogrid solution was chosen because significantly economical (almost 8 times less expensive than stone columns) and faster in construction in comparison with other feasible conventional solutions available in the Oman market. For more information, you can download the full technical paper on the Duqm Roads project, which was presented at the 3rd African Regional Conference on Geosynthetics GeoAfrica 2017.